When I was growing up, I wanted science-based toys and books, and I was very lucky to have supportive parents who gave me a chemistry set and a bug catcher (among other outstanding gifts) for my birthday and Christmas presents. Dolls didn’t appeal to me, as I preferred living creatures like babies, puppies, and kittens – I ended up studying zoology at university to obtain a Bachelor of Science. I often wonder if there were girls from earlier era felt the same way. This got me to thinking about suffragettes. Suffragettes were a social and political phenomenon existing for over a century. Doll and toy makers would have to be tempted to capture the likeness of suffragettes in their items. Just a quick investigation turned up quite a few games and such. The suffragettes made a few dolls and games to sell at rallies to raise funds. Others were made by those politically against women’s suffrage, and were often less than flattering, if not downright scary (like the Jill-in-the-Box). However, if I had been around in that era, I would have been purchasing suffragette toys for my daughters. Because you can aspire to be someone you know nothing about. What I like about these toys is that they show the women active and involved, not passive. Even if they hadn’t seen representing suffragettes, they showed women with agency. Mechanical tin suffragette selling pamphlets. Suffragette Chain Link Jewellery at its finest, as it also incorporates the three colours of the Suffragette Movement: Green, White and Violet (Give Women Votes). It is a well known fact that suffragettes were targeted by their governments as troublemakers, and often spent time in jail, and they were subjected to some awful treatment. They were meant to be humiliated and silenced by this strategy. Instead, suffragettes saw jail time as a victory, that they were considered dangerous enough to incarcerate. Emmeline Pankhurst and her daughter, Christabel, while in jail. In previous blog articles, I have mentioned suffragette jewellery. Some people argue that the suffragettes were vocal, and would never stoop to subterfuge by wearing symbolic jewellery. I have to agree with this viewpoint. I believe suffragette jewellery was worn with pride, to support the cause, and I believe some suffragette jewellery supports this hypothesis: the Holloway Prison Pin, Chain Link Jewellery, and Edith Garrud’s Boadicea Brooch. Holloway brooch designed by Sylvia Pankhurst. Comprising a porcullis symbol of the House of commons, the gate and hanging chaines in silver and the superimposed broad arrow in purple, white and green enamel. Referred to in Votes for Women, 16 April 1909 and first presented to ex-suffragette prisoners at a mass demonstration at the Albert Hall on 29th April 1909. The Holloway Prison Pin, also known as the Holloway Brooch. The Holloway Prison Pin – designed by Sylvia Pankhurst, one of the daughters of Emmeline Pankhurst – was presented to members of the Women’s Social and Political Union who had suffered imprisonment. The first presentation of the brooches took place at a mass demonstration organised by the WSPU on the 29th of April, 1909. The broad arrow – the symbol of the convict – was enamelled in purple, white and green, the colours of the suffragette movement. Some of the brooches were marked with dates of imprisonment. The brooch was first mentioned in Votes for Women, the WSPU newspaper, in the issue published on the 16th of April, 1909, where it was described as ‘the Victoria Cross of the Union’. After the Holloway Prison pin, the suffragettes were inspired to issue pins and medals for other indignities suffered by the women when they were imprisoned for wanting equal rights. To my mind, it is the Hunger Strike Medal that represents the greatest sacrifices made by those imprisoned; hunger strikers were often force fed. Some of the women were also sent to mental asylums, because being vocal about wanting the vote is a sure sign of madness. Chain brooches didn’t just symbolise imprisonment. It also stood for the chains that held the women back in society. The chains that held them back from education and legal rights, as well as the right to vote. Mind you, the government was happy to tax women, but not so thrilled to give them a voice in parliament. Chain brooches came in many shapes and forms. Some were more decorative than others, but even the most simple chain brooch was layered with meaning. Of course, the suffragette movement was big on pins and brooches. They could be sold to raise funds, worn to show support, or awarded for outstanding sacrifices. It is a form of wearing your heart on your sleeve. Edith Garrud’s Boudica brooch was also described as the Suffragette’s Victoria Cross. Chains are often part of a Steampunk cosplay outfit. Never was there a better reason to wear them than to celebrate the Suffragettes. A Stereotype: a widely held but fixed and oversimplified image or idea of a particular type of person or thing. A Caricature: a picture, description, or imitation of a person in which certain striking characteristics are exaggerated in order to create a comic or grotesque effect. Caricatures of the attendees at an Australian suffragette meeting. The stereotype versus the caricature. The Stereotype of a Suffragette from the viewpoint of those against the suffragette movement. Above is a small selection of pro-suffragette cartoons, showing the suffragettes had a sense of humour even in the most dire circumstances. It always amuses me when women are accused of having no sense of humour. This comment is usually made by someone who just made a very misogynistic joke or hasn’t understood the humour of a woman’s joke. It argues that women do have a sense of humour … but it is those making the accusation that aren’t getting the joke. Humour is a great weapon in the political arena. It makes a pointed comment, without using a real spear. Of course, pro-suffragette/pro-suffragist propaganda was a mere drop in the flood of anti-suffragist discourse. Because most of the media was run by men, and most of those men wanted to support the status quo. In the pro-propaganda, the suffragettes and suffragists are portrayed by normal-looking women. In the anti-propaganda, they were always made to either look like harridans or dismissed as fluffy followers of fashion – with wanting equal rights the equivalent of wanting a new hat. The men (and the children) are always depicted as victims of their wives’ aspirations, henpecked or abandoned. Suffragette Madonna – I’ve never been able to figure out if this was meant in an ironical sense. Want to bet that two minutes earlier, he had flicked his cigar ashes all over her newly cleaned carpet? The real issue behind both sorts of propaganda was about giving voice to – or suppressing – women’s politics and attitudes. The majority of women wanted to be taken seriously and given representation in the political and legal spheres of public life. The domestic sphere was a cage or a jail. 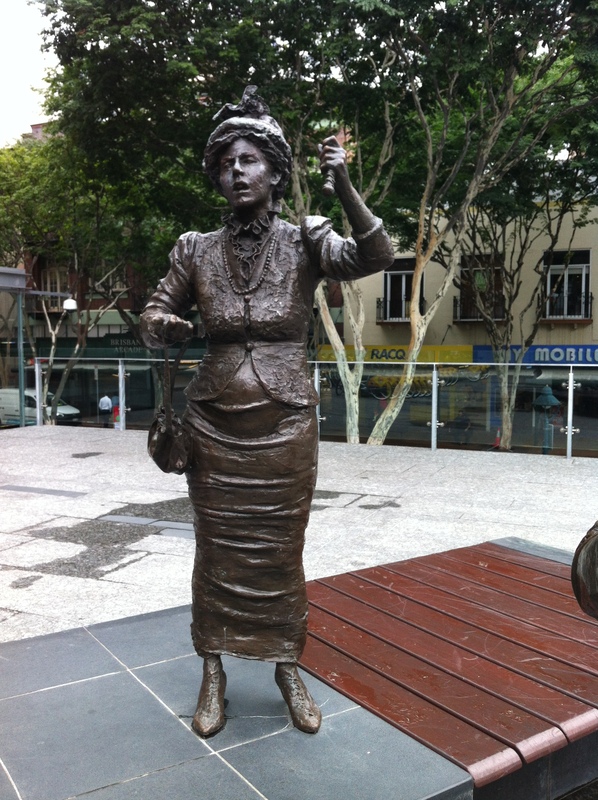 The Statue of Emma Miller the Suffragist in King George Square, Brisbane, Queensland. I don’t know if this happens to everyone, but I am one of those people who have clusters of coincidences. Just this weekend, I bought a book that explained the differences between a suffragist and a suffragette – though both were working towards the same goal. 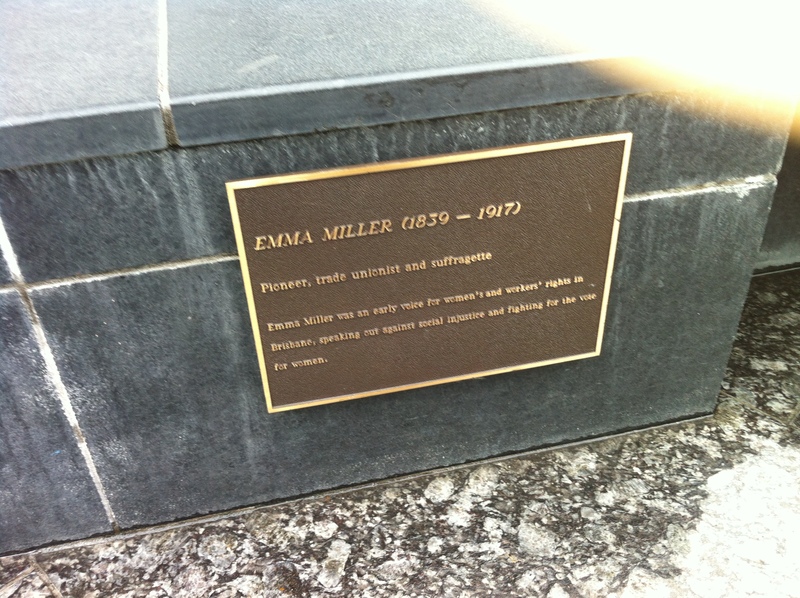 And now, on the Monday, I came across a statue dedicated to the memory of a Queensland Suffragist: Emma Miller. A week ago, I had no idea what a suffragist even was… I’m guessing I would have thought plaque below the statue was misspelt. I was (and am) pleased to see this statue in a reasonable prominent position in the town centre, and Miller is in the company of Steele Rudd, the pseudonym of writer Arthur Hoey Davis and Sir Charles Lilley, the fourth premier of Queensland. I had heard of Steele Rudd, but I had no idea who Emma Miller was. As soon as I got home, I started digging. Emma Miller (26 June 1839 – 22 January 1917) was a pioneer trade union organiser, suffragist, and key figure in organisations which led to the founding of the Australian Labour Party (now known as the ALP or the Labor Party) in Brisbane, Queensland, Australia. The establishment of the Women’s Equal Franchise Association in 1894, almost immediately suffered a split with Leontine Cooper leaving to form the Women’s Suffrage League, alleging that the WEFA was too close to the labour movement which could hinder women’s enfranchisement. Miller remained and was elected President of the Women’s Equal Franchise Association (1894 – 1905), the remaining period of its existence. Despite the differences, Emma Miller, Leontine Cooper and the conservative Women’s Christian Temperance Union often worked together on suffrage issues. Women were granted the vote for the Queensland parliament on 25 January 1905, although not the right to stand for parliament. Emma Miller believed in equal pay for women, legal entitlements for women, the was a strong supporter of the women’s right to vote. During her term as President of the Woman’s Equal Franchise Association (1894 – 1905) she advocated for the introduction of legislation to grant women the right to vote. On 2 February 1912, during a demonstration for Brisbane General Strike for the right to organise trade unions, the 73-year-old Emma led a contingent of women on a march to Brisbane’s Parliament House. A wall of police charged at the women,and they defended themselves with whatever came to hand, such as their umbrellas. While on horseback, Police Commissioner Cahill charged at Emma. She wasn’t any frail old lady to be scared of a man on a horse. In an effort to defend herself, she pricked his horse with her hatpin, causing Cahill to be thrown off. He later walked with a limp. I’m sorry the horse was stabbed, by the way, but my mum is 73 next year and I imagine she would be terrified if a police was charging at her mounted on a horse. The Suffragists were set up in 1897 by Millicent Fawcett as a union of the different suffrage campaigning groups in Britain. They campaigned peacefully through means such as meetings, debates, leaflets,petitions etc. they also put forwards male candidates in elections as opposition to liberal and tory candidates who opposed women suffrage. The Suffragettes were founded in 1903 by Emmaline Pankhurst, a suffragist who was frustrated by the suffragists apparent lack of progress. The suffragettes were made up of women who thought the same as Emmaline Pankhurst. They campaigned through more direct action such as harrassing MPs, disrupting meetings, and even burning postboxes and buildings. As you can see, Emma Miller was probably militant enough to be considered a suffragette, but as she worked through the proper political channels to achieve her goals, and she was interested in gaining rights for male workers, she was more properly considered a Suffragist.